There are Countries which are more fascinating then others. Sometimes there is no peculiar reason for that. It is just a feeling. One can't really explain it logically. But you feel the urge to travel there – again and again. Actually, for me this is Nepal. You may remember I already mentioned it in my last post about countries to visit in 2017. This time I will provide some more information on this wonderful country. The first time I went to Nepal about five years ago. At first I really felt uncomfortable and insecure. I was overwhelmed by dusty and dirty streets, chaotic traffic and people everywhere. Everything was totally different. But in the end I just fell for this country. Nepal is located in the South of Asia adjacent to India and China. It is often being referred to as the “Roof of the World” because some of the highest mountains of the world are located there. When it does comes to the culture, it is a very beautiful, colourful, lively and exciting country. All kinds of religious groups like Buddhists, Christians and Hindus live there together peacefully. If you decide to travel to Nepal, you can expect wonderful guides tours to the fascinating mountain landscape of the Himalayas. And if you are really well trained, you can take the challenge to pay the highest mountain of the World, the Mount Everest, a visit and take a closer look. Further information on this kind of tours can be found in common guide books http://www.gebraucht-kaufen.de/reisef%C3%BChrer-nepal. 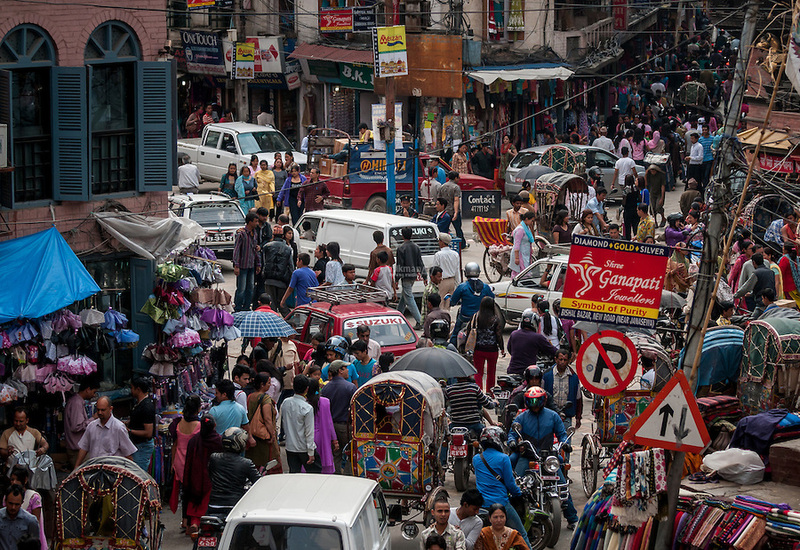 The first impression of Kathmandu is really terrifying. The city is loud, busy and chaotic. But don't let that scare you away! This is just the first impression. Take a closer look and you will realise that the capital of Nepal is a very loveable and lively city with a somewhat organized chaos. There is a lot to explore and this city really reminds me why I love to travel. There are so many small hidden gardens, which are perfect to take a rest, relax and enjoy the sun. Furthermore Kathmandu is very cheap. Exploring its culinary delights won't cost a fortune. The same goes for good accommodation. And you will always find friendly, likeable people willing to help you. Last but not least, the area around Kathmandu is definitely worth a visit. It is surrounded by a majestic mountain scenery. Every time you leave the city you will see snow-covered summits under a clear, blue sky. It is just breathtakingly beautiful. So don't forget to take a proper camera with you to take some great pictures. I personally use a Nikon D7200 (www.nikon.de) I bought a few years back and which as served me well through all my journeys. Nepal offers some of the most beautiful but also most dangerous trekking tours in the world. Don't make the most common mistake and try to get to the Mount Everest as fast as possible! Then you may suffer from Anoxia, also know as mountain sickness. Even because of the amazing landscapes you should take your time. The journey into the mountains will be a unique and unforgettable adventure. If you are willing to take a tour, make sure you are equipped properly. Some equipment may seem expensive, but it is always a good option to consider buying it second hand. One website I regularly use is Gebraucht-Kaufen.de. In my opinion good trekking shoes are absolutely necessary. Make sure they have a Vibram sole, which will provide a good foothold. I found some cheap and barely used ones on http://www.gebraucht-kaufen.de/wanderschuhe-vibram. I highly recommend the tour to the Annapurna. You will see crystal clear lakes. From time to time you will pass by small, local tribal villages. These people are so amazingly friendly and hospitable. They will offer you a room for a night as well as some food. So don't miss your chance on the wonders of Nepal!